Refer to the exhibit. What will be the result of entering this configuration the next time a network administrator connects a console cable to the router and no additional commands have been entered? The administrator will be presented with the R1> prompt. 2. Why are port numbers included in the TCP header of a segment? Controlled media access involves collision handling. It is responsible for detecting transmission errors in transmitted data. It uses contention-based access also known as deterministic access. Data link layer protocols define the rules for access to different media. 7. Open the PT activity. Perform the tasks in the activity instructions and then answer the question. Which information is obtained from this command output? 8. A PC that is communicating with a web server is utilizing a window size of 6,000 bytes when sending data and a packet size of 1,500 bytes. What byte of information will the web server acknowledge after it has received four packets of data from the PC? 9. Why are the paired wires twisted in a CAT5 cable? 12. The administrator of a branch office receives an IPv6 prefix of 2001:db8:3000::/52 from the corporate network manager. How many subnets can the administrator create? 14. Which is a function of the show ip route command when used as a tool for troubleshooting network connectivity? 15. Which service will translate private internal IP addresses into Internet routable public IP addresses? The Header Checksum field name from IPv4 is kept in IPv6. The Destination Address field is new in IPv6. The Source Address field name from IPv4 is kept in IPv6. The Version field from IPv4 is not kept in IPv6. The Time-to-Live field from IPv4 has been replaced by the Hop Limit field in IPv6. 17. Which statement describes a characteristic of the traceroute utility? It sends four Echo Request messages. It utilizes the ICMP Source Quench messages. It is primarily used to test connectivity between two hosts. It identifies the routers in the path from a source host to a destination host. Refer to the exhibit. Using VLSM, what is the largest and smallest subnet mask required on this network in order to minimize address waste? Refer to the graphic. What is the effect of setting the security mode to WEP on the Linksys integrated router? It identifies the wireless LAN. It allows the access point to inform clients of its presence. It translates IP addresses into easy-to-remember domain names. It encrypts data between the wireless client and the access point. It translates an internal address or group of addresses into an outside, public address. Refer to the exhibit. From global configuration mode, an administrator is attempting to create a message-of-the-day banner by using the command banner motd V Authorized access only! Violators will be prosecuted! V When users log in using Telnet, the banner does not appear correctly. What is the problem? The delimiting character appears in the banner message. The symbol "!" signals the end of a banner message. Refer to the exhibit. An administrator is testing connectivity to a remote device with the IP address 10.1.1.1. What does the output of this command indicate? A router along the path did not have a route to the destination. 25. A small satellite office has been given the overall network number of 192.168.99.0/24 and the network technician can subdivide the network addresses as needed. The office needs network access for both wired and wireless devices. However, because of the security consideration, these two networks should be separate. The wired network will have 20 devices. The wireless network has a potential connection of 45 devices. Which addressing scheme would be most efficient for these two networks? 26. Using default settings, what is the next step in the router boot sequence after the IOS loads from flash? Search for a backup IOS in ROM. Load the bootstrap program from ROM. Load the running-config file from RAM. Locate and load the startup-config file from NVRAM. 27. Fill in the blank. Do not abbreviate. Use lower case. Which interface configuration mode command puts a Layer 3 switch interface into Layer 3 mode? 28. What is an ISP? It is a standards body that develops cabling and wiring standards for networking. It is a protocol that establishes how computers within a local network communicate. It is an organization that enables individuals and businesses to connect to the Internet. It is a networking device that combines the functionality of several different networking devices in one. 29. A network administrator has been issued a network address of 192.31.7.64/26. How many subnets of equal size could be created from the assigned /26 network by using a /28 prefix? 31. Fill in the blank. In dotted decimal notation, the IP address ...............is the last host address for the network 172.25.0.64/26. A frame with the destination MAC address of RouterA. A packet with the destination IP address of ServerB. 34. What will a host on an Ethernet network do if it receives a frame with a destination MAC address that does not match its own MAC address? It will discard the frame. 35. A network administrator enters the service password-encryption command into the configuration mode of a router. What does this command accomplish? This command encrypts passwords as they are transmitted across serial WAN links. This command prevents someone from viewing the running configuration passwords. This command enables a strong encryption algorithm for the enable secret password command. This command automatically encrypts passwords in configuration files that are currently stored in NVRAM. This command provides an exclusive encrypted password for external service personnel who are required to do router maintenance. 36. What is one purpose of the TCP three-way handshake? It can rapidly adapt to the loss of data transmission facilities. It efficiently utilizes the network infrastructure to transfer data. Data packets can travel multiple paths through the network simultaneously. It allows for billing of network use by the amount of time a connection is established. It requires that a data circuit between the source and destination be established before data can be transferred. 38. 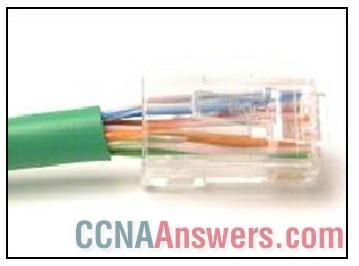 What is the function of CSMA/CA in a WLAN? It provides the mechanism for media access. It describes the smallest building block of the WLAN. It assures that clients are connected to the correct WLAN. It allows a host to move between cells without loss of signal. 40. Fill in the blank using a number. The minimum Ethernet frame size is............. bytes. Anything smaller than that should be considered a "runt frame." Refer to the exhibit. A network engineer is attempting to connect to a new router to perform the initial configuration. The engineer connects a rollover cable from the serial port of a PC to the Aux port on the router, then configures HyperTerminal as shown. The engineer cannot get a login prompt in HyperTerminal. What would fix the problem? Connect to the Ethernet port on the PC. Change connection settings to even parity. Move the cable to the router console port. Use a crossover cable instead of a rollover cable. 42. A router boots and enters setup mode. What is the reason for this? 44. A network administrator is designing a new network infrastructure that includes both wired and wireless connectivity. Under which situation would a wireless connection be recommended? The end-user device only has an Ethernet NIC. The end-user device requires a dedicated connection because of performance requirements. The end-user device needs mobility when connecting to the network. The end-user device area has a high concentration of RFI. 45. Which devices should be secured to mitigate against MAC address spoofing attacks? 46. To revert to a previous configuration, an administrator issues the command copy tftp startup-config on a router and enters the host address and file name when prompted. After the command is completed, why does the current configuration remain unchanged? The command should have been copy startup-config tftp. The configuration should have been copied to the running configuration instead. The configuration changes were copied into RAM and require a reboot to take effect. A TFTP server can only be used to restore the Cisco IOS, not the router configuration. 47. A network team is comparing physical WAN topologies for connecting remote sites to a headquarters building. Which topology provides high availability and connects some, but not all, remote sites? 48. A medium-sized business is researching available options for connecting to the Internet. The company is looking for a high speed option with dedicated, symmetric access. Which connection type should the company choose? 50. 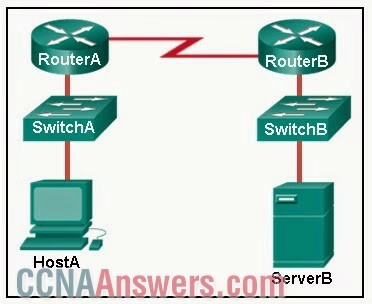 Which router configuration mode would an administrator use to configure the router for SSH or Telnet login access? 51. What information is added during encapsulation at OSI Layer 3? Refer to the exhibit. Which layer of the OSI model would format data in this way? 53. Which IPv6 address notation is valid? 54. Open the PT Activity. Perform the tasks in the activity instructions and then answer the question. What is the secret keyword that is displayed on the web page? 55. The ARP table in a switch maps which two types of address together? 56. A network administrator is troubleshooting connectivity issues on a server. Using a tester, the administrator notices that the signals generated by the server NIC are distorted and not usable. In which layer of the OSI model is the error categorized? 57. A user calls the help desk to report that a Windows XP workstation is unable to connect to the network after startup and that a popup window says "This connection has limited or no connectivity." The technician asks the user to issue the ipconfig /all command. The user reports the IP address is 169.254.69.196 with subnet mask of 255.255.0.0 and nothing is displayed for the DNS server IP address. What is the cause of the problem? The workstation NIC has malfunctioned. The subnet mask was configured incorrectly. The DNS server IP address needs to be configured. The workstation is unable to obtain an IP address from a DHCP server.